LONDON, February 11, 2019 – Revelations expected to further stoke the fires over Jeremy Corbyn’s handling of anti-Semitism within the Labour Party have been published in the British press. The Mail on Sunday dedicated a dozen pages of coverage to initial serialisation of a new book by one of the country’s leading investigative authors. 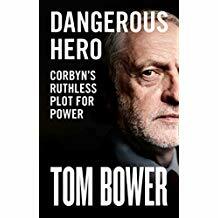 Tom Bower’s Dangerous Hero (William Collins, £20) is a damning expose of a man “not fit to govern”, even in the words of long-time friend and former hard-left MP Reg Race. The trouble is, he has failed to build his life on the Rock – Jesus, the Jewish Messiah – which ultimately explains his reluctance to deal effectively with gross anti-Semitism within his party. And then he added: “Everyone who hears these words of mine and puts them into practice is like a wise man who built his house on the rock. The rain came down, the streams rose, and the winds blew and beat against that house; yet it did not fall, because it had its foundation on the rock.